I selected the Bee Hat Building as one of my favorite eleven buildings in the Saint Louis area as published in an article in St. Louis At Home magazine. This beautiful seven-story loft building was once an important part of Saint Louis's garment district. Washington Avenue became a particularly desirable location following the opening of the Eads Bridge in 1874. Many similar warehouse type structures where erected on either side of the street in the years that followed. The structure was originally erected in 1899 by another hat company before the Bee Hat Company moved into the building in 1926 when they began operating their warehousing and distribution from this location. 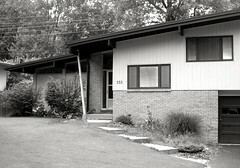 The company presently operates from 2839 Olive Street, but remained headquartered on Washington Avenue through the year 2000. The building has been declared a City Landmark and is Eligible for the National Register of Historic Places. It is presently undergoing renovations for residential lofts and ground floor commercial space. The ground floor is surmounted by eleven lions' heads which were originally connected to the building's rooftop drainage gutter system. The downspouts have been directed elsewhere and steam lines have been hooked up to them. 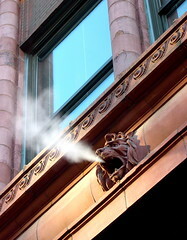 The owner of the building intends to have the lions roar on a regular basis. You can find the list of all eleven buildings on the Saint Louis At Home magazine's blog. You can find more of my photographs of the Bee Hat Building on my Flickr photostream. Photograph by Andrew Raimist, December 2006. Andrew Raimist will be giving a slide talk on Harris Armstrong on Friday 16 February 2007 at 11:45am at Webster University. Seating is limited. To RSVP and obtain directions, please send an email to: Raimist@RaimistArchitecture.com. You can find blog entries specifically addressing the Magic Chef Building here. Photograph by Hedrich-Blessing courtesy of the Harris Armstrong Archives, Special Collections, Washington University in Saint Louis. 533 Woodleaf Court, Kirkwood, Missouri. This home at 533 Woodleaf Court in Kirkwood is part of a subdivision designed entirely by Harris Armstrong working with the developer and builder Marshall Berry. Armstrong had collaborated with Berry on at least one other development (a cul-de-sac in Creve Coeur). He also designed Berry's Ladue home which is no longer extant. The ten houses share a general typology, but each has individual characteristics to differentiate it from the other nine homes on the street. Each home is a split-level ranch featuring high ceilings and exposed heavy timber framing. You can find additional photographs and a detailed description of the house at the blog M.O.R.E. Photograph by Andrew Raimist, July 2006. Noguchi & Stone Memorial proposal. 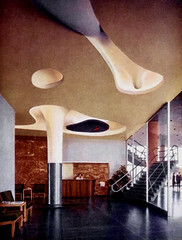 designers: Isamu Noguchi and Edward Durrell Stone. Architect Stone and sculptor Noguchi worked together on this entry to the Jefferson National Expansion Memorial Competition for the riverfront area located between downtown Saint Louis and the Mississippi River. The competition was ultimately won by Eero Saarinen with his proposal for the Gateway Arch. It appears from the design that Noguchi was a primary influence on the site development and landscape forms while Stone was perhaps more responsible for the architectural and infrastructure elements (like the bridges, buildings, and monumental vertical pylon). Clearly, the design works as one cohesive design concept where each element works together with the entire composition, holistically blending sculpted land forms, berms, fountains, riverside inlet, water courses, and low-lying unobtrusive modernist, buildings. The landscape, sculptural, and architectural elements all feature a coherent biomorphic aesthetic. The tall, thin central pylon acts as the symbolic focal point for the composition near the Old Cathedral up away from the river's edge. Archival image by Ezra Stoller.